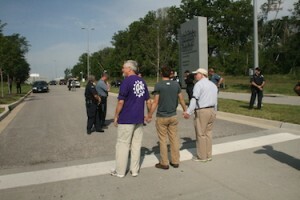 From left, Jim Hannah, Mark Bartholomew, and Henry Stoever crossing the line at NNSA plant. Two folks who crossed a forbidden line, all to say they oppose nuclear weapons, came to Municipal Court in Kansas City, Mo., for a hearing Oct. 21. Mark Bartholomew, of Holy Family Catholic Worker House, pleaded “guilty” of stepping across the line, and Judge Elena Franco sentenced him to 40 hours of community service and two years of probation. Henry Stoever, peace lawyer, pleaded “not guilty,” and Franco will try him for his resistance Friday, Dec. 19, at 1:30 p.m. The pair had been arrested on August 22 along with retired Community of Christ minister Jim Hannah. The three men crossed onto the property of the brand new Kansas City nuclear weapons parts plant, where officials were gathered for a dedication ceremony. Hannah had received 40 hours of community service during an earlier court date. On October 21, Mark and Henry spoke to about 20 supporters at a rally before the court hearing. Explaining why he did not bail out after being arrested for trespass Aug. 22 at KC’s new nuclear weapons parts plant, Mark said, “I work with folks who don’t have the resources to bail out.” At Holy Family he feeds the hungry, befriends them. As he was being driven to the downtown police station to be held overnight in the summer heat, police asked him, “Are you sure you want to go there?” It was as if he didn’t belong there, as if his life were more valuable than those of others to whom police would never pose that question. Mark said at the rally that his fee for doing community service would be about $80, and there’d be other charges. “I may choose not to pay the fees,” he said, noting that the neighbors who come to Holy Family could not pay such fees. Sure, there may be consequences for that choice. “It is not OK to say my life is more important than theirs,” he insisted. When it was Henry’s turn to submit a plea to Franco, he said “not guilty” and received the Dec. 19 trial date. Franco asked him about an earlier trial he had appealed to the state level, also for line-crossing at the new nuke-parts plant, and Henry said the charges were dropped, so he had no jury trial, which he had wished to have. Franco replied, “That was one shot.” It seems she, for one, expects Henry to take the same tack in December. During the rally, Henry welcomed people, including those from PeaceWorks, All Souls Unitarian Universalist Church, and friends of Holy Family Catholic Worker. He said, “It matters what we are doing here! These weapons have consequences!” Duty and truth are essential focuses of a court, he said, and attorneys are supposed to elevate the law and improve the practice of justice. “There’s no disputing the facts” of the line-crossing, he said. “Yet there’s no acknowledgment by the city that these are weapons of mass destruction, part of a global threat,” that producing these WMDs violates the Nuclear Non-Proliferation Treaty, and that making these weapons has consequences of illness and death from the contaminants involved. “Only through activism will we bring truth to the public,” he added.